Castleton Tower near Moab, Utah. There’s just something about the still desert air and open expanses. Especially with a light blanket of snow covering it. Utah is truly a magical place. Prior to this trip I’d only been to Salt Lake City for a brief visit. All the magical places–Bryce Canyon, Zion, Grand-Staircase Escalante, Arches, and much more–all lie in the southern half of the state. My first visit through the area was for a quick getaway while I was living in Ouray, Colorado. On the drive over I managed to get a flat tire in the middle of nowhere which impeded my time exploring the Moab area. But visiting Moab and Arches the surrounding area was absolutely amazing. Even with the spare tire on my truck I managed to make my way down the long dirt road so I could camp below the iconic desert towers that I’d heard so much about. The campground was quiet with the exception of a few climbers hanging about and waiting for their chance to head make their way to the tiny pinnacle above the desert floor. 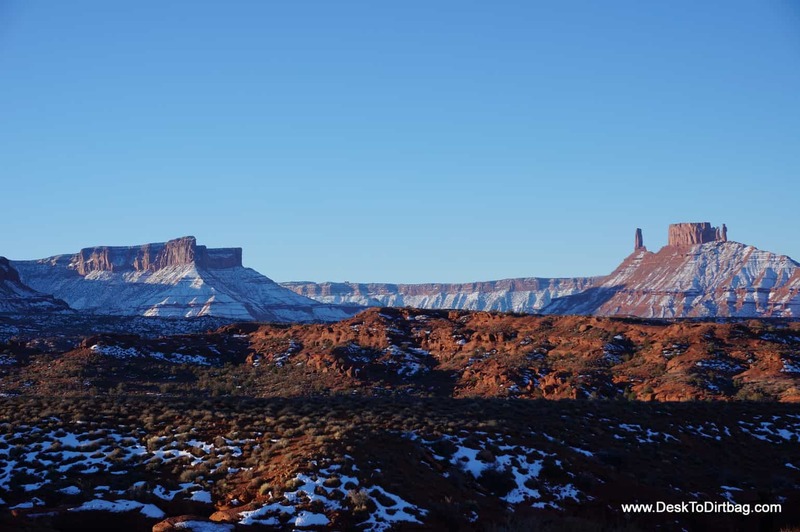 In the morning, the day was cold and clear — waking up below Fisher Towers with a light dusting of snow, taking in the crisp morning air while brewing a cup of coffee is a divine experience. A few months later, after passing through New Mexico, Arizona, California, and Nevada, I came full circle and explored the SW corner of Utah in late spring, although this time a little further to the west. Don’t miss out on Utah’s mother nature, there is truly a lifetime worth of adventures to be had in this state, and it’s a place that you can’t miss on any west coast road trip or if you take a monster national park road trip across the entire country. Wouldn’t that be an incredible experience? Don’t miss my budget travel resources to help you get out there more and save money. The southern half of the state is the most beautiful place on Earth, as far as I’m concerned. But I lived in northern Utah for 4 or 5 years and I wouldn’t say that “all” of the magical places are in the southern half of the state. Northern Utah has some incredible places too. Do Google Image Searches for the Uinta Mountains, Deseret Peak, Bonneville Salt Flats, etc. Plus you’ve got the climbing areas that are magical in their own right, like Maple Canyon, Big and Little Cottonwood, etc. Alright, alright, fair enough. I neglected to explore the northern half, just blasted through to Colorado. Maybe I’ll get back there and check out more of what the northern half has to offer. I’d definitely love to drive through Bonneville Slat Flats.